The glassy state problem is often separated into two major components [1, 2]. One of these concerns the reasons that glasses form in the first place, and deals with the circumstance that glasses are usually metastable with respect to crystals so that crystallization must be avoided. 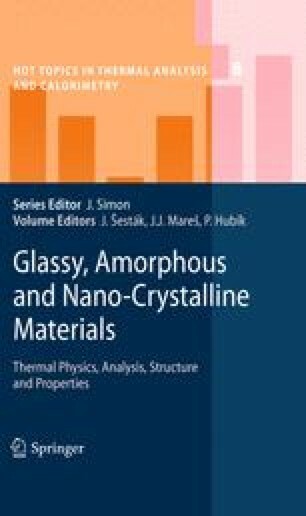 The second deals with the question of how liquids behave when crystals do not form, and it is with this component that we are concerned in this chapter. Here the central phenomenon with which we must deal, in seeking to understand vitrification, is the heat capacity function and the change in that function that accompanies the freezing in of the disordered state. This phenomenon is illustrated in Fig. 2.1 for a typical molecular liquid, 2-pentene vitrified by both liquid cooling and by vapor deposition . Support of the NSF, DMR (Solid State Chemistry) and Chemistry divisions, Grant numbers 0454672 and 0404714, is gratefully acknowledged. We have profited from helpful discussions with Dmitry Matyushov and Ranko Richert. Yuanzheng Yue, Thomas Loerting and group, Masaharu Oguni Gene Stanley Sergey Buldyrev and group, Srikanth Sastry, Pablo Debenedetti and Mark Ediger.